Look out criminals - the Caped Crusader and Boy Wonder are on the case! And they have cheat codes! You don't see the name Batman associated much with comedy nowadays. That's why it's nice to see this cartoony beat-em-up add some much-needed levity to what's become a very gritty franchise. Arkham Asylum this is not - both adults and kids will find themselves chuckling as they punch through levels as the Bat-ster and his host of sidekicks. With its witty banter and entertaining scenery, Batman: The Brave and the Bold might even charm you into having fun for a little while. There's just one little problem: you can't lose. It's mind-boggling. When one of your characters runs out of health, he instantly respawns with no penalty other than a loss of coins, which are used to buy upgrades, which there's no reason to even bother touching because you can't lose. Don't have any coins? You'll respawn anyway. There's no danger of seeing a Game Over screen or losing any of your progress, which makes bad guys, traps, and boss fights about as interesting as cleaning an air conditioning filter. Want to win? Just hammer A. Maybe this design choice was to make the game more appealing to children, but it's insulting to their intelligence. Harkening back to arcade beat-em-ups of old, the core gameplay consists of side-scrolling stages filled with hordes of baddies to pummel. It's not bad until you realize there's no reason to try to stay alive. The boss fights are actually innovative and could have been fun if fighting them felt less like beating up a crippled child. Then there's the counter-intuitive control scheme, the dim-witted sidekick AI, and the big, inviting “press A” graphic during cutscenes that appears to fast-forward through lines of dialogue, but actually skips entire scenes. The writing is excellent - too bad unveiling it is such a chore. 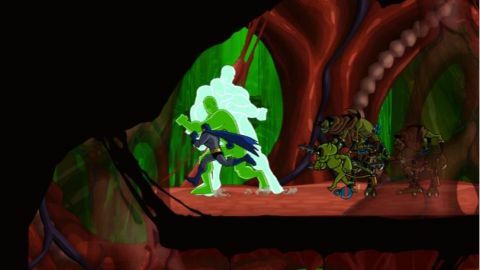 Batman: The Brave and the Bold takes place over four chapters, each separated into a handful of levels. You can grab a second controller and team up with a friend or family member, but you might not want to subject them to the boredom. Short, fun adventure that the kids will enjoy.